There are two definitive differences between St. Louis and Los Angeles: Autumn is better in St. Louis, and more people speak Spanish in Los Angeles. And, yeah, there’s the Mississippi River and the humidity and the beach and the film industry and the palm trees, but in terms of my own private geography and topophilia, autumn and Spanish are the differences that matter. I long for LA in every season but fall, and a part of my longing is, inevitably, a longing for Spanish. Let me be clear: my Spanish is not as good as it once was, as it should be, or as I would like it to be. At my best, I could read a newspaper, and now I struggle with verb conjugation as I try to teach my son a limited number of phrases. I had to correct my pronunciation of Sepulveda when I arrived in LA, and I had to constantly remind myself that Californians do not place the accent in Cordova on the first syllable as they do in my hometown of Santa Fe, New Mexico. But during my time in California, the straining to understand when I rudely eavesdropped, the sorting of accents (Guatemalan, Mexican, Honduran), the delight in piecing together the history behind the names of the streets and the neighborhoods and the mountains – from Pico to Los Feliz to the San Gabriels – wrapped me in Spanish, and somehow made me feel comfortable with the constant struggle to comprehend a landscape written in a different language. I knew I moved through the city with a cloak of privilege. White Angelinos stereotypically treat Latinos, especially recent immigrants, as invisible workers. I tried to buck the stereotype, but my stumbling Spanish was usually no more than comic relief to native speakers. No one ever questioned (as they have some of my Latino friends) whether English was my first language. And when I was tired or distracted or just disinclined, I never had to speak Spanish to navigate the metro or read the paper or, even, to order at a restaurant. I’m willing to entertain the thought that my relationship to Spanish was no more than a condescending quest for local color, but I like to think it was more than that. I like to think that the city loved me in Spanish. It was in a spirit of perversity that, just as the leaves began to turn, the mosquitoes began to die, and the outdoors became bearable, I decided to accompany my husband to Cherokee Street in St. Louis for Mexican food. Cherokee Street has a burgeoning Latino community, boosting St. Louis’s Hispanic population to a whopping 2%. Nonetheless, undocumented residents perhaps double that number, and co-workers tell me they’ve watched St. Louis’s Latino population grow, especially within the Catholic community. For what it’s worth, I can’t stand on more than one street corner at a time, and from the corner of Cherokee and California it could almost have been LA. It was a hot, dry day. Dust actually blew past the furniture rental stores. Squint, and I could almost smell the Santa Anas. Our restaurant had a Spanish soap opera on the television, the waitress served the coke in a tall glass bottle. For a few minutes, it felt like the city loved me. 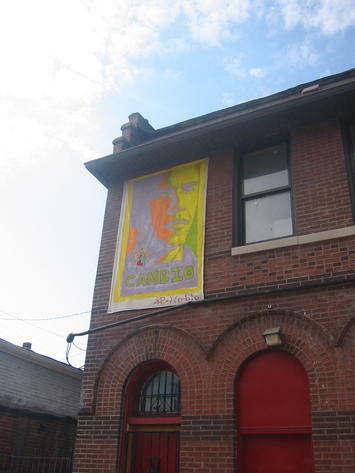 Head west on Cherokee, and you will see a huge Obama poster with the word, Cambio – Change – written across the bottom, and an image of the Virgin of Guadalupe in the corner. In these final days of the campaign, images of Obama seem more and more to reflect what their creators want to see. The poster is, arguably, a picture of St. Louis’s potential future: a majority black city with a growing Latino, especially Mexican, population. I look at the poster, up against St. Louis’s characteristic red brick, and hope that Latinos here will be visible in a new way. I remember a bumper sticker, “Rednecks for Obama,” that I saw recently in my neighborhood. I remember that St. Louis is no blank slate when it comes to race relations. I chastise myself for being naive. I note that the poster says cambio, not esperanza; change, not hope. I think about how to tell my son, in Spanish, where I’ve been that day. Submitted by zion1122 on Sat, 09/07/2013 - 07:11. Submitted by robert1122 on Thu, 08/29/2013 - 07:07. Submitted by zion1122 on Sat, 08/24/2013 - 09:33. Submitted by zion1122 on Tue, 08/20/2013 - 07:38. Submitted by zion1122 on Wed, 08/07/2013 - 05:17.